I didn't see a single kitchen sink in Minions, but there was a bathtub, an anvil, a tank, and a flying saucer, all crashing down on the movie's trio of yellow, pill-shaped, pip-squeak heroes in one manic Looney Tunes flash. So, to say that the team behind this hyper-animated spinoff of the Despicable Me movies throws in everything but the kitchen sink isn't much of an overstatement. Beginning in prehistoric times and making its delirious way to 1968 (when else? ), Minions finds the googly-eyed Kevin, Stuart, and Bob in search of a villain to serve. They are henchmen without portfolio - and without a decipherable utterance. Sometimes, their high-octave, high-octane minion-speak sounds like Japanese, other times like an obscure Eastern European tongue. Sami? Frisian? Udmurt? The animators and designers have gone whole-hog for 1960s fashions, furnishings, and fixtures. The opening cartoon credit sequence, done to the Turtles' "Happy Together," is a throwback to '60s flicks, and the soundtrack is a'tumble with hits of the day: the Box Tops, the Monkees, the Kinks, the Rolling Stones, the Who, and yes, the Fab Four, themselves. 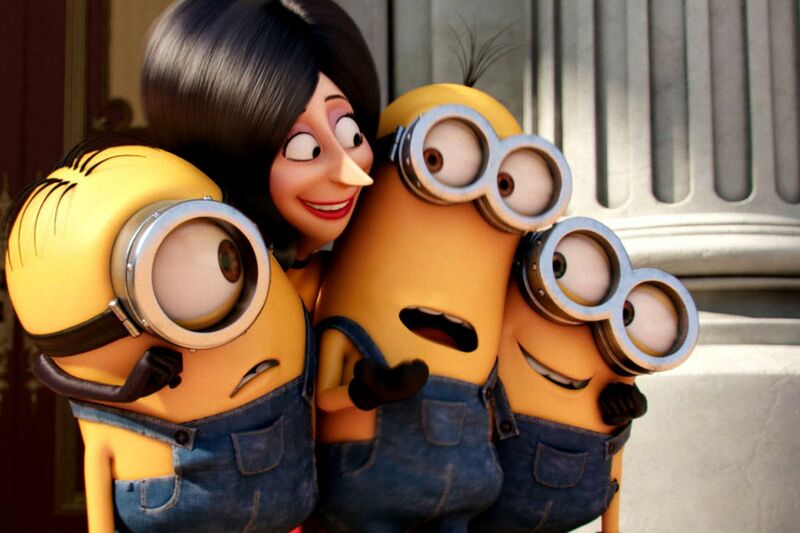 Minions may just be an excuse to cash in on the phenomenal success of the Despicable Me franchise (Part 3 already has a release date: June 30, 2017), but as crass commercial enterprises go, this prequel gives its all. All nutty, all nonsensical, all aboard. Jon Hamm, Allison Janney, Michael Keaton. Distributed by Universal Pictures. Running time: 1 hour, 31 mins. Parent's guide: PG (cartoon mayhem, adult themes).